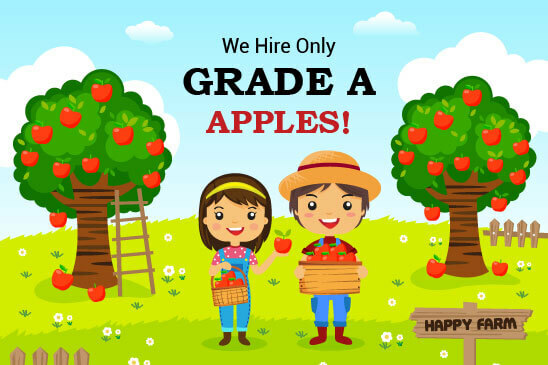 Tanners Orchard offers high performance, high energy job positions packed with fun! Entertainment and SMILES are our game. Are you ready to play? As part of the Tanners team, you will interact directly with our guests. Your performance can turn our guests into TANNER FANS! Our family-friendly-funtastic environment is the place our guests have chosen to enjoy. Let’s plaster a smile on their faces that will linger long after they have gone home. From the moment they drive into Tanners Orchard, their experience as a VIP guest begins. As part of the Tanners Team, whether in the market, bakery, U-pick, or out in the Back 40 Fun Acres; creating a “seamless” guest experience is your challenge. GAME ON: Your passion for your Tanners performance is evident, your knowledge of the farm is on the tip of your tongue, and your FUN is in full play. We take our APPLES seriously! We offer a variety of jobs, covering a diverse range of skills. Manager positions are available. If you know you are meant to be part of the Tanners Team, download an application.